Jules Demarco's family has been at war with the Angottis for decades. They each own rival Italian restaurants in Chicago, and the contention has always gotten in between Jules and Sawyer Angotti, who used to be friends as kids. Now in high school, Jules still has a crush on Sawyer, but knows better than to ever show it. But for the past few weeks, Jules has been seeing the same horrifying scene over and over again on billboards, windows, and TV screens. It's a wintry evening, and a fiery crash claims the lives of nine victims—one of them Sawyer. Jules know she can't be passive about these visions, but can her one-time friendship with Sawyer be enough to convince him that she isn't crazy and his life is in danger? Lisa McMann's trademark direct and absorbing narrative works perfectly for this highly entertaining story of familial and romantic entanglements. Jules is an unassuming and easy-to-like narrator who is just as upfront about how scared she is to be experiencing her visions as she is about her feelings for Sawyer Angotti. She struggles with family loyalty as her visions increase, torn between doing what she feels is right and what she knows her family would expect. Luckily she isn’t alone as she tries to find a solutions; she has the support of her siblings, Trey and Rowan, even if they don’t know the entire story about what's going on with her. The dynamics between the three are fantastic; they are more like comrades in a war zone, complete with pizza sauce, icy sidewalks, and a giant meatball-topped truck, rather than siblings. Tension mounts as Jules begins to take more and more personal risks to ensure Sawyer's safety, endearing her to no one except perhaps Sawyer, who isn't quite sure what to make of her claims. McMann sends her characters along an emotionally harrowing and action-filled trajectory, culminating in a highly satisfactory climax, but she doesn't stop there—family secrets are revealed that shed light on the antagonism between the Demarcos and Angottis and leave readers hanging. The action is superb, and the pull of the protagonist's voice nearly irresistible. Crash is yet another winner from McMann. Cover Comments: I really enjoy the simplicity of Lisa McMann's YA covers, and this one is nice. It seems pretty straightforward until you notice the flames in the iris. Very good! 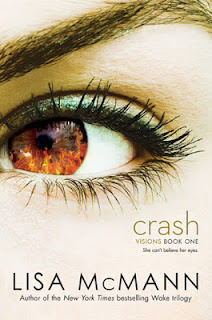 Crash will be released on January 8th, 2013. I've loved all of Lisa McMan's Wake Trilogy (Cryer's Cross was a little too creepy, even if the writing was amazing). Sounds like this is another one to get my hands on!